Carpvale saw the site's potential and in 2008 purchased the lake and the surrounding land. Work then took place with the lake being extended to its current size. The site was fully otter fenced and shortly after the lake was stocked with a wide variety of double figure Carp from our own fish farms. The lake holds a large head of Mirrors, with the lake record currently at 27.14. Along with these there are a number of good commons with the record standing at 30.4, Ghost Carp to 24.10 and also Catfish to 39.08. We have a long-term stocking policy which sees the introduction of new fish every winter from our sites. Doubles has 14 wood chipped bivvy swims but only allows 12 anglers at any one time giving the last angler to arrive a choice of 3 swims. 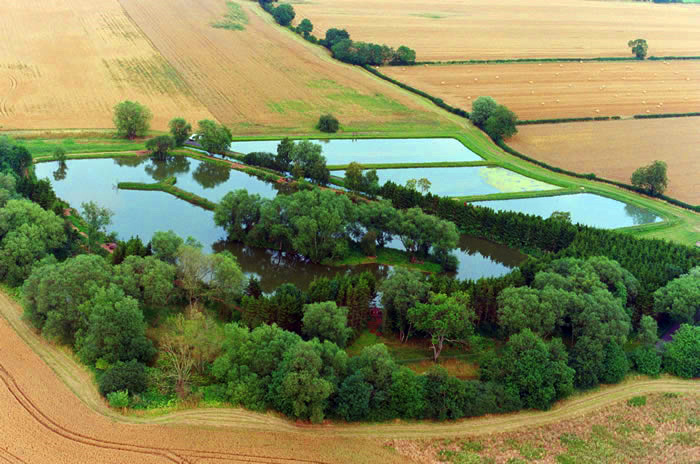 Each swim has an island feature as well as a marginal cover, making each capable of producing fish. Doubles offers a flush toilet as well as a cold water tap and adequate parking just a short stroll from the lake. 1st July 2017. Please note that from this date only anglers who have booked on will be allowed at the fishery between 8 pm to 8 am. No guest night visitors will be allowed on the fishery. Anglers may have visitors between 8 am to 8pm. Any angler wanting to fish at Carpvale Doubles must have pre-booked before fishing. Payment is required in full at the time of booking for day tickets and 24 hour permits. A minimum of 50% deposit is required for all other bookings. On bank holidays, the minimum session available is 48 hours. All anglers who fish at Doubles will be asked to fill in a catch return form. Once a month one catch return form is drawn out to win a 24 hour fishing permit. Once your deposit has been paid in full, you may cancel up to 7 days before the date of your event and receive a full refund. If you wish to cancel within the last 7 days prior to your booking date, a refund will only be offered if another angler can be found to take the place. Carpvale Doubles is situated close to the market town of Malton. All anglers must have pre booked. All litter must be removed from your peg at the site. Any angler found more than ONE peg away from unattended rods will be told to leave. Anglers must refrain from climbing on or interfering with the fence in any way. Anglers must remain within the lake boundary and not interfere with any vegetation or trees. Only two rods per angler to be in use at any one time. Only carp rods to be used. All fish must be returned to the lake, anyone found removing fish WILL be prosecuted. No fish to be sacked or held for any reason. All anglers must have their own large unhooking mat. Barbless or microbarb hooks only. No fixed leads to be used. No braided main lines to be used other than for marker and spod rods. No nuts to be used as hook baits or in particle mixtures. Fishing is only allowed from designated swims. All anglers must have a minimum of a 36" landing net. NO dead baits, or live baits allowed. NO treble hooks or wire traces allowed. Any angler found breaking any of the above rules will be told to leave without a refund.